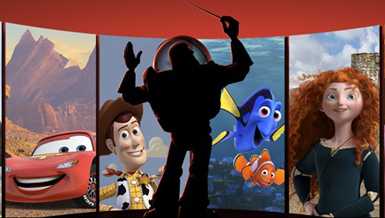 Showcasing the iconic work of composers Randy Newman, Thomas Newman, Michael Giacchino and Patrick Doyle, extracts from Pixar films are magically brought to life by the stunning orchestra, conducted by Helmut Imig. The UK premiere of this magnificent production includes 13 of the studios’ films, and the only thing it is missing is their most recent hit, Monsters University. From Randy Newman’s Toy Story series that captured the hearts of every generation, to the loveable Finding Nemo composed by his cousin Thomas, the evening celebrates the music that films just could not survive without. The heart-breaking opening sequence to Up, accompanied by Giacchino’s fantastic score, proves just how much a film relies on its soundtrack and the Royal Philharmonic Concert Orchestra ensured there was not a dry eye in the room. A journey through Pixar could not be complete without the feisty Scottish princess, Merida, with bagpipes featured to complete Doyle’s score to Brave, enthralling the whole family. The show also included clips from A Bug’s Life, Cars, Cars 2, The Incredibles, Monsters Inc, Ratatouille and Wall-E. It was Randy Newman’s You’ve Got a Friend in Me, however, that stole the hearts of the audience who could not have asked for more from the triumphant celebration of the much-loved animation studio.